In February, billionaire investor Warren Buffett announced that he was dropping 90 percent of his stock in Walmart. This is a grim prophecy for the retail juggernaut, which faces stiff competition in rival Amazon. Walmart, in addition to encouraging customers to order online and pick up in store, has recently announced the launch of a new online marketplace called “Store No. 8” in an effort to stay relevant in an increasingly digital marketplace. It’s common knowledge these days that ecommerce is on the rise and showing no signs of slowing down. Embattled brick-and-mortar stores are doing anything they can to keep themselves relevant in a rapidly changing market, with corporations Walmart and Amazon at the forefront. Warren Buffett’s stock drop has serious implications for Walmart and other companies with too heavy a focus on physical retail, like Macy’s and Kohl’s. While these companies still dominate the list of largest retailers, the trend is a downward one. Companies based online, however, are seeing some serious growth. Amazon alone accounted for 43 percent of online sales last year, an unheard of market share in years of retail past. Considering Buffett’s retreat and the trends favoring digital commerce, it’s clear that Walmart has some work to do if they want to hold their own in this clash of titans. Ecommerce has some stark advantages over traditional brick-and-mortar retail. For one, online retailers don’t have to pay the costs associated with maintaining a physical store. This eliminates expenses like rent and utilities, which are an extremely large part of many businesses’ overhead. Also, an online business doesn’t need to hire and pay staff to stock shelves and man the registers – rather, they only need enough people to run a website and work on marketing. An increasing number of older corporations are attempting to create online marketplaces to take advantage of this. While they’re maintaining their traditional buildings, they’re fighting to improve their internet presence so their customers can purchase from them in any way they prefer, utilizing a strategy called omnichannel retailing. In terms of advertisement, online marketing has a massive advantage in audience size. Goods can be sold to anyone, anywhere; companies are limited only by laws and delivery capability. Brick-and-mortar stores are constrained to their immediate area and have to factor in traffic to their storefronts and competition from nearby businesses. If your company does business online, the world is your oyster. You simply have to worry about appealing to your potential customers. Physical retail does, however, offer one distinct advantage: customers still like to look at and touch the things they buy in person. This, called showrooming, was once seen as a threat — it was believed that customers would go into stores, look at merchandise, and then go online and buy. However, according to Business Insider, customers are actually more likely to browse online, then go to a store near them and make their purchase. This is good news for physical retailers like Walmart; if they can take advantage of omnichannel retail and offer both a physical location and a broader online marketplace for customers, relevance might be within their grasp. Walmart represents the old guard of retail, with over 11,000 stores operating in the United States and internationally — even more if you include Sam’s Club. Pulling in $485.9 billion in total revenue in 2016, Walmart’s come a long way from founding their flagship location in 1962. They’ve been the face of large-scale retail for decades, and remain the king of the hill worldwide — for the time being. While many, Buffett included, are proclaiming the death knell of traditional retail, Walmart’s not going down without a fight. In 2016, Walmart acquired Jet.com, a discount-oriented ecommerce site, and appointed Jet’s founder, Marc Lore, CEO of Walmart Ecommerce U.S. It’s a move meant to increase both the variety of goods Walmart offers and its ability to reach a wider consumer base, and has recently started to pay off. Jet has begun acquiring successful online businesses like ModCloth, a retro clothing store, and Moosejaw, purveyor of outdoor gear, among others. This in addition to Store No. 8, a “tech incubator” that will allow digital startup companies to operate under the Walmart umbrella and take advantage of the plethora of resources employed by the corporation. A win-win, Store No. 8 will provide a lucrative opportunity for these fledgling companies, and at the same time add to Walmart’s ecommerce presence. All involved will operate within the Jet division, cementing its place as the pivotal point of Walmart’s modernization efforts. Walmart is also heavily promoting a buy online, pick up in store system. As of April 19th, Walmart customers will be able to order items online, and then go to their nearest store to pick it up. This gives consumers access to Walmart’s now-extensive online catalog, while enabling the store to ship these items through its own internal network of trucks, rather than having to ship externally to people’s homes. Only time will tell whether Warren Buffet’s intuition will hold true, but Walmart is not sitting idly by. With Lore at the helm, it’s making a potent effort to adapt to today’s consumer. 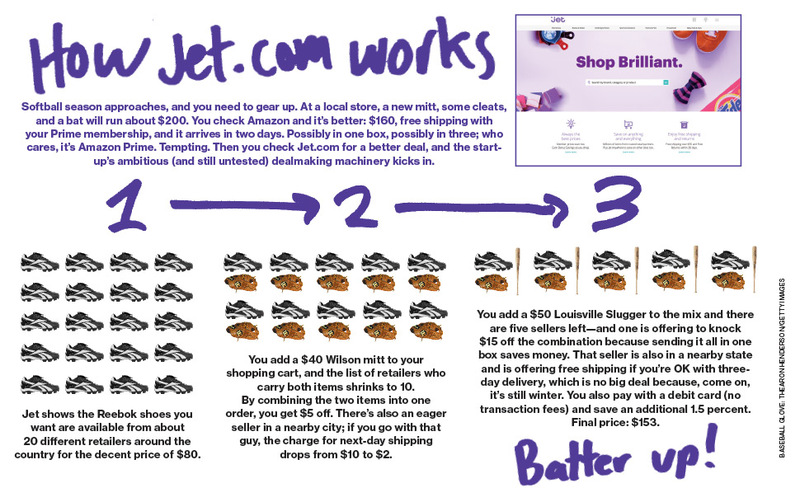 Jet.com, Store No. 8, and an efficient in-store pickup scheme give it the tools it needs to take on the prophecies of doom they now face. Its thousands of locations worldwide put Walmart in a unique position to utilize omnichannel retailing, which may be the biggest advantage it holds over Amazon and other competitors. As the largest retail chain in a rapidly-shifting world, Walmart is the barometer for the future of the retail industry.